Although deer may be interesting to observe in your yard, they can damage your landscape plants. Deer especially like eating new growth. To avoid losing your garden to deer, use native plants likely to be unpleasant to the local deer palate. 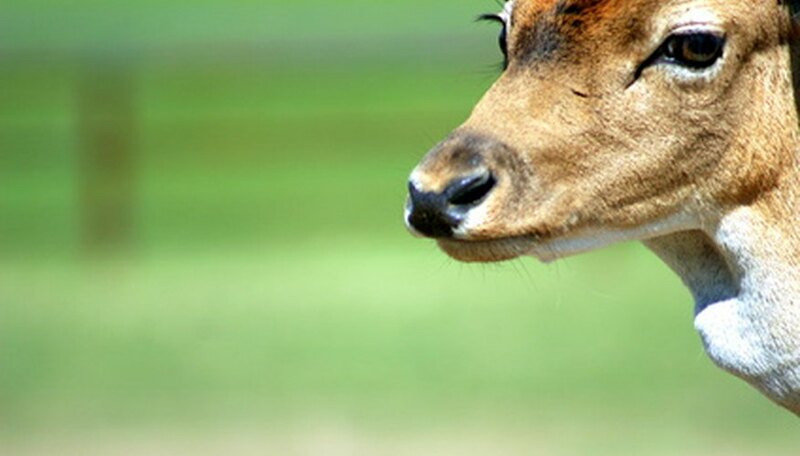 Deer do not care for plants with fuzzy, rough, tough leaves or strong scents. Astilbe biternata, also known as Appalachian false goat's beard, grows 2 to 6 feet tall. The white flower clusters bloom from April to July. It displays bright green fern-like foliage. This plant typically grows in the Southeastern United States from Maryland to Georgia and west to Mississippi. Astilbe prefers part shade and moist soil. Scarlet bee balm (Monarda didyma), a member of the mint family, typically produces a fragrant cluster of red tubular flowers. This plant grows 2 to 6 feet tall and often attracts hummingbirds and butterflies. Scarlet bee balm is also known as Oswego tea because the leaves were used for making tea. In addition to tea, the leaves were used to treat bee stings. Scarlet bee balm blooms from May to October. This plant prefers sun or part shade and wet soil. Black-eyed Susan (Rudbeckia hirta) displays yellow flowers with dark brown centers. This plant blooms from June to September. Use this perennial to prevent erosion and to feed wild birds. Black-eyed Susan will grow in a range of soil types, but prefers sandy, well-drained soil. This plant is hardy to USDA Hardiness Zone 4. Lanceleaf tickseed (Coreopsis lanceolata), has 1 to 2 inch yellow flowers that sit on top of slender stems up to 2 feet high. This plant typically blooms from April to June. Lanceleaf tickseed grown in full sun will produce many blooms. If deadheaded after the first blooming, reblooming may occur. This plant is hardy in USDA Hardiness Zones 5 to 9. Lobelia cardinalis or cardinal flower, grows 1 to 6 feet tall with red flowers that grow in 8-inch spikes. This plant attracts hummingbird and requires them for pollination. In addition, butterflies are attracted to this flower. The cardinal flower blooms from May to October, does not require much water and grows in sun to shade conditions. This plant is toxic if eaten in large quantities. It has moderate deer resistance. The common milkweed (Asclepias syriaca) has unbranched stems with a mounded cluster of pale purple flowers. This plant produces a cardiac clycoside, which makes monarch butterflies toxic to predators. Common milkweed blooms from June to August and requires full sun. The milky sap from this plant is toxic if eaten in large quantities. Missouri Department of Conservation: Can gardeners and white-tailed deer coexist? Fairfax County Virginia: Deer Resistant Plants?